Way to go India! Wish the workers in the USA would notice this and understand their power. Notice how he speaks about coverage of this in India - it isn't being covered. Hmmm sound familiar? Like our press doesn't cover many events when it's the "we the people" standing up to power. Prashad: "one of the striking features of this, Sharmini, is going to be that the press is barely going to report the fact that such a large part of the Indian workforce went on strike. There will be barely a mention of it. And this has got a lot to do with the fact of who owns the press." Then he goes on to say "But I would like to say something to my friends in the press, that many of the newspapers and television channels are also running with labor practices that have been challenged by the Indian trade unions, so they should feel a personal stake in the struggles of the Indian trade unions. Those who work in television channels in France, in the United States, etc., they know what it's like to have their pensions squeezed, they know what it's like to get their benefits cut. So that's precisely what the Indian workers are fighting for. They're not fighting simply for themselves; they're fighting to imagine a new dispensation." This short interview covers many aspects of what is going on - we can learn from this. Good luck to all these workers for fighting for what is fair. They do make a good example of the way employees rights are stepped on all over the world. This will have such an impact on production and demand. I'm sure many of these companies get rich off of the export of many Indian made goods. This should hit the BIG manufacturers right in their pocket where it hurts them the most. All the workers want is some respect and fair pay. I hope the companies will bow down to their good efforts. Now, that is one massive protest! Very glad to see it happen. This abuse of laborers has got to stop---worldwide. And, yes---this should become a worldwide protest. It was actually dreamed of back during Occupy as I recall. Although there were some scattered labor protests, it never really caught on back then. Lois says it all. Thanks. Occupy wanted worldwide because if there are workers to be exploited anywhere we can never have a fair playing field for all workers. Workers in the west who had fought hard to obtain worker and environmental rights lost their jobs when these companies could move to areas that had no rights on the books. The workers were exploited with low wages, harmful work environments and the environment as a whole suffered with rivers and lands being polluted. So they gained our jobs but they also suffered with what our workers had fought to stop that was happening to them back in the 1800's and early 1900's. Now these jobs are coming back to American Prisons Making a Profit Off of Slave Labor and TPP is set to go into Countries like Vietnam whose workers are still only making 93 cents per hour. So how do Countries like the USA, Canada, Australia, and the UK suppose to compete wage wise with that? We can't. Until all workers are treated fairly we'll continue to have Corporations ruining lives while they enrich a few at the top. Strikes never achieve anything. Communication is real. This is huge! "Power to the people!" Thank you very much for sharing, Dandelion. 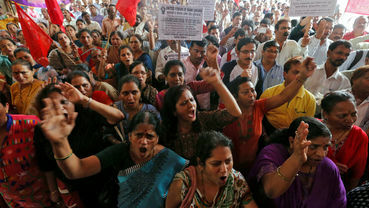 "This strike is fight against the Modi government's labor laws and a fight for the rights of informal sector workers to create trade unions and have them recognized within Indian labor law, says Vijay Prashad"
2. Corporate Capitalist companies outsourcing their work to India to exploit cheap labour force. Margie. . . Striking IS a form of communication. Indeed, strikes are the singular voice of the masses when the singular voices of the individuals were not being listened to. It certainly is a form of communication and in this case is getting the attention of a lot of people in their Country and around the world, despite how Corporate media tries to ignore it.
" Workers unite .You have nothing to lose but your chains'.All power to them. Noted, & seriously, good for them, too. Good luck to the workers. Stay united - then you're strong.